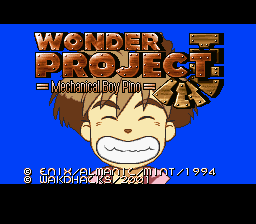 Wonder Project J: Kikai no Shonen Pino is a role playing game for the Super Nintendo. 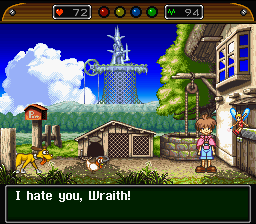 This is a really cool game from Enix, evil programmers extraordinaire. You are the human controller for a robot whose creator was kidnapped. 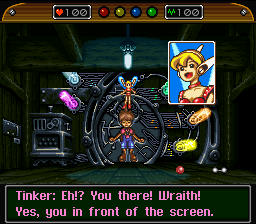 Your commands, issued via an interface unit that looks rather like a fairy, are carried out by the robot. If he feels like it. Your other job is to condition him into doing the actions you want him to. For instance, if he walks over to a book and throws it like a baseball, you gotta slap him upside his head. If he reads it, you have to praise him. Simple enough, huh? Wrong. If he gets scolded too many times, he’ll stop listening to you. Period. 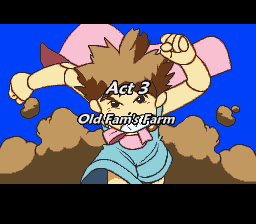 And except for when the robot misbehaves too many times in a row, this is a damn fun game. And hey, if you didn’t catch it before, it’s Enix. You’re obliged to play it. So stop reading and make with the playing.